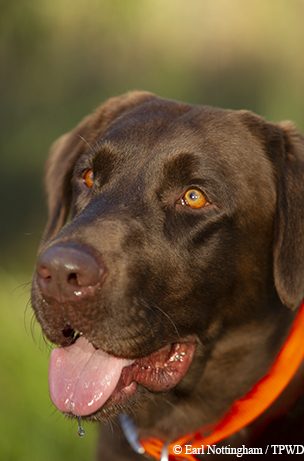 Top hunting dogs compete at the Master National Retriever Hunt Test. 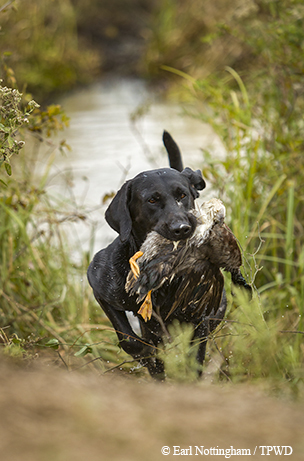 Dorothy Ruehman’s black Labrador retriever, Ruby, had just completed a series of retrieves that most duck hunters would brag about the rest of their lives. Remaining steady despite birds flying overhead, she sat smartly at Dorothy’s whistle, then took hand signals to a downed duck on a long retrieve. She finished with a “blind retrieve” across 30 yards of water and 20 yards of brushy cover on the far bank. But this was not an average duck hunt, and Ruby isn’t an average retriever. Likewise, her “mom,” Dorothy, doesn’t have average expectations. 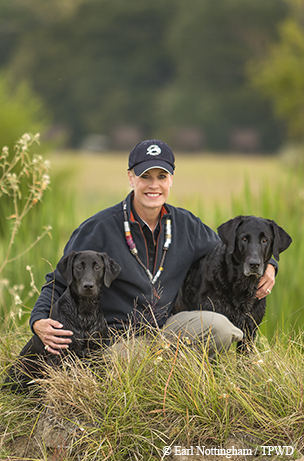 Ruby ran her series before a large gallery and demanding judges at the 2017 Master National Retriever Hunt Test in Texas, arguably the most difficult retriever test available, at what many veteran handlers considered the toughest venue they’d seen. Now, five more series at widely varying test sites loomed. These would include simultaneous downed birds and one or more blind retrieves, in which the dog doesn’t see where the bird landed. Ruby could accept assistance on only one more marked bird. In the highest realms of dogdom, field trials and hunt tests allow the most talented dogs to shine. 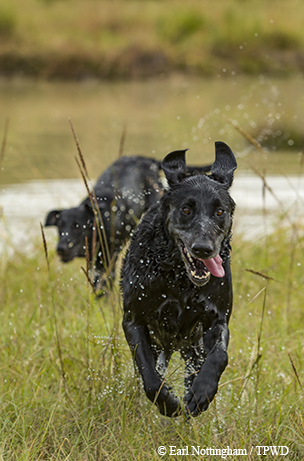 As the name suggests, field trials are competitive — dog and handler against dog and handler on courses designed to eliminate competitors and determine the leading edge of retriever performance. 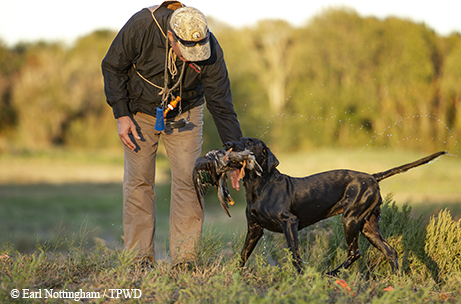 Good field trial retrievers routinely handle tasks far beyond anything expected of even exceptional shooting dogs. Top competitors are rarely used in hunting because the on-the-spot adjustments common during hunts might encourage independence and imprecision that, while useful in the field, would be considered sloppy by field trial judges. Yet, by determining the possible and continually pushing boundaries, field trialers do hunters a great service through training innovation and breed improvement. Find a talented young shooting dog and you’ll almost certainly find a field trial champion somewhere in the bloodline. Hunt tests, as opposed to field trials, measure dogs against a standard. Well-designed retriever tests simulate actual hunting conditions. At the highest levels, the tests require performance at the very extremes of what might be expected of an outstanding hunting dog. Unlike field trial handlers, who wear white jackets to be visible to dogs at great distances, hunt test handlers wear drab or camo clothing appropriate to actual hunting. The American Kennel Club (AKC) sanctions tests at the Junior Hunter, Senior Hunter and Master Hunter levels. A dog that earns a Junior Hunter title is a well-started youngster with potential to go to the next level. A Senior Hunter is a fine shooting dog that any hunter would be proud of. A Master Hunter is a superb dog that could grace the boat or blind of the most demanding professional hunting guide. The Master National sits at the top, a test for dogs that have successfully run at least six Master Hunt tests in a given year. The 2017 Master National featured 820 retrievers at The Big Woods on the Trinity, 7,500 acres of hardwood bottomland, grassland, ponds and sloughs around Catfish Creek, a tributary of the Trinity River, in East Texas. Owner Robert “Doc” McFarlane named the property in honor of The Big Woods of William Faulkner’s short stories and novellas. Labrador and golden retrievers predominated, but a few Chesapeake Bay retrievers, Boykin spaniels, Nova Scotia duck tolling retrievers and one standard poodle made the cut as well. The East Texas Black Gumbo Retriever Club hosted the event. As can be expected in East Texas in October, afternoon temperatures rose into the low 90s, far from ideal scenting conditions but consistent with the heat of dove season and early teal season. At the orientation, hunt officials reassured visitors concerned about venomous snakes and alligators. Although Dorothy Ruehman grew up hunting doves and quail on family ranches in South Texas, her first well-trained gun dog, a chocolate Lab named Otis, came along with her husband, Michael, in 1988. Problem was, Otis brought her ducks and geese to Michael, not her. But, at only 6, Ellelee died of cancer. Dorothy bought her first serious competition dog, Jessie, from a kennel in Oregon in 1998. Jessie garnered 58 Master passes. Her willful younger sister, Hula, who joined the family a year later, managed six Master passes. In 2005, an owner in Katy asked Dorothy to take on Kate, his young Lab. Although the pup had shown potential, her professional trainer didn’t like her, and Kate returned the sentiment. Dorothy took Kate into her home in Richmond and got to work. Treated as a member of the family, Kate qualified for the 2005 Master National. At that point, the pro decided he liked her and took her back. The appreciative owner gave Dorothy a female out of Kate’s 2006 litter. That pup, Coal, went on to successfully finish five consecutive Master Nationals. Come time for another pup, Dorothy went back to Kate. Coal’s younger sister, Ruby, the smallest of only three puppies, wasn’t breathing when she was born and had to be resuscitated. She went on to outgrow her two bruiser brothers. Now, at the age of 7, at her fifth Master National, she snored in the back of the SUV while Dorothy described the challenges ahead. You might think that someone who’d qualified retrievers in dozens of Master tests and several Master Nationals would train her dogs for hours every day. Although these formal training sessions take place in the field, sometimes with a professional trainer on hand, Dorothy schools her dogs constantly at her home in Richmond. This discipline doesn’t make machines of the dogs. Ruby also serves as a therapy dog in a local ICU and psychological ward and assists Dorothy in Christian motivational demonstrations. As the week progressed, fewer and fewer trailers and pickups pulled into The Big Woods each morning just before daylight. Excellent dogs headed home, failed because of mistakes, by handler as well as dog. Some will run again at the 2018 Master National and other tests. Others, because of age or decisions by owners and trainers, will retire from testing and finish their careers as companions and fine hunting dogs. On Sunday afternoon, I found Dede Paterson waiting at a land-only test at a site called Middle Church, a mix of open grassland, mottes and woodland that would severely test the dogs’ ability to see where the birds land. Jones, her 41/2-year-old Lab, had already run a perfect land-water series. Jones’ 21/2-year-old pup Tryst had also qualified for the Master National. In 2008, a rescued English setter led Dede into serious retriever training. After she and her husband, Wayne, put a little weight on “Sam,” they decided he needed a companion. Since Wayne loved to hunt ducks and doves, a Lab seemed like a perfect choice. At a neighbor’s suggestion, the Patersons joined a local retriever club in hopes of running some edge off the pup. The exercise helped. They soon added a pup from a local professional trainer and took him all the way to the 2012 Master National in Greensboro, Alabama. The couple met at Texas A&M. On their first date, Wayne took Dede duck hunting. The Patersons train four or five days a week. The sessions range from 15 minutes of backyard drilling to ambitious scenario training with their local training group. Dede and Jones would need to be at their best because the conditions at The Big Woods made the tests harder. “The combination of water and woods here makes for very realistic tests,” Dede says. For the Patersons, this event included as much poignancy as excitement. Annie died just before it was time to head from their home in Goliad to The Big Woods. “She was Wayne’s ‘everything’ dog,” Dede says. “She helped us raise all the puppies that came after her." After a weekend of rooting for dogs and handlers, watching the best retriever work I had ever seen, I headed home for the work-week, eager to return Friday for the final day of testing. Results from Dorothy and Dede came in by text message throughout the week. As I looked over those messages, I could hear the women’s voices and feel their excitement. Only 39 percent of the entrants passed the 2017 Master National at The Big Woods. Late Friday afternoon, along the main drive, the rich October light made for perfect photos of retrievers and handlers posed beside autumn arrangements of straw bales and pumpkins and 2017 Master National signs. The handlers would gather that night for the closing banquet. Dogs would be honored; a few would be inducted into the Hall of Fame. Dorothy would receive the Women’s Challenge Trophy for successfully handling Ruby through three Master Nationals. The much-thinned crowd, the cooling temperatures and the first hints of fall color reminded me that the best part of hunting season lay ahead. Next morning, most of these dogs would be heading home to their real jobs.